Hi! And welcome to the Ontology SampleSwap ESX24 instrument downloads page. May these tools inspire you! Samples are provided as .zip archives and will work for both Macintosh and Windows. These instruments aren't simple AKAI conversions; they are original creations speicifically for the EXS24. The samples they use may or may not be cleared for commercial use. Please read the notes at the bottom of this page for details. ... there's a free mailing list just for EXS24 users? Attention noizesmiths! If you have an original EXS instrument you'd like to contribute, please visit Ontology's sampleswap.org. If you like these sample banks and want to give something back... well, I'm a DJ, so can I have your original music? Email Me! Description: Individual big gong hits lovingly recorded by Amani Friend. Mapped on keyboard both as single hits and as a pitched multisample where hitting keys harder reveals various types of strikes. Description: Jaw-dropping cut-through the mix original squeaks blips blarts and farts. Super digital, guaranteed to flatten your hair back. Original creations submitted to Ontology by "Atom Hard". Description: More Atom Hard innovations. Absolutely useful, possibly edible. Sounds that bite back. Plus, you can use them as drums. Description: ALL YOUR BASS ARE BELONG TO US. Thunderous (but still pitched!) jungle bass massage. Description: Three banks of rip-roaring, crisp, tweaky, banging, spacenoid and fuzzed up percussive hits. Especially good for when you've got the right groove, but you can't find the right drum sound. Samples are purposefully mapped in no particular order to encourage gestalt moments and happy discoveries. Description: Hard 'n' nasty 165 bpm drum 'n' bass loops, composed of 55 "recycled" drum loop fragments. Two .exs files are provided -- one with straight velocity = loudness, while the other uses fixed loudness and uses velocity to control a 24db "fat" cutoff filter for those wacky sweeping filter rolls you jungle hedz love so much. The .zip file also includes a MIDI file which will play the complete loops in sequence. By importing this MIDI file and bringing the sequence into your own arrangement, you can use the matrix editor or GM drum editor to re-arrange the breaks as you see fit. Description: Basic upright bass. Play quietly to dampen the string slapping sound. Description: A rich noisy single sample pad with lots of atmospheric harmonics. Key velocity changes length of fade-in. Description: Various noisy weirdly filtered looping techno bits optimized for 140 bpm. Includes one drum loop (and variations) but focuses more on background synthy and effect sounds. Suitable for performing. Description: Mapped drum kit. Electronic drum and percussive sounds. Fairly techno oriented. Use mod wheel and pitch bend for fun. 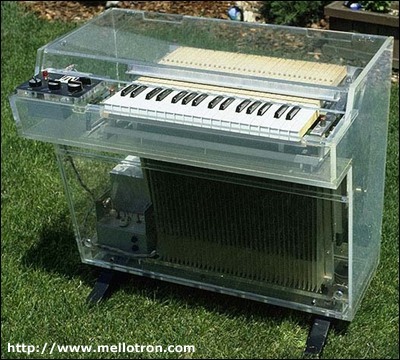 Description: The mellotron was the "sampler before samplers". It used tiny tape loops instead of digital audio, so it had a dirty (but warm) analog sound to it. And it looked even crazier than it sounded! This is a big dramatic female choir doing not quite 'oh' not quite 'ahh'. Very philip glass. * THIS SITE IS NOT ASSOCIATED WITH EMAGIC! Furthermore, Emagic probably owns trademarks for Logic Audio, ESX24, etc. The samples featured here are not necessarily "royalty free" or "cleared" or "public domain"!!! SampleSwap members from all over the world have contributed these samples, and it's impossible for us to tell which samples are original and which have been lifted from recordings or sample CD-ROMs. Ontology makes a "best effort" to filter out or identify samples which have obviously been obviously ripped off. You alone are responsible for making sure you are not violating any copyrights when you use these instrument files*. * By the way, this is also the case when you purchase commercial sample CDs. Even though they may say you can use the samples in a commercial work, if it turns out that they violated someone's copyright to obtain their samples, you are still the one who is held responsible. Ouch! 1. You may not distribute the samples in connection with any for-profit activity. 2. You may not alter the distribution itself, i.e. do not change the name, read me files, or audio content. Distribute the .zip files as they are. Canton Becker will not be held liable for any reckless acts of funkiness that these sample libraries may inspire. By downloading these samples, you implicitly agree to headbang and otherwise freak out in a Responsible Way.